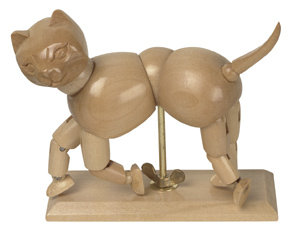 Sketch or draw cats with precision and accuracy with this perfectly proportioned manikin. Every cat owner knows that their feline friends are capable of contorting themselves into nearly any position. Now you can accurately portray cats and their unique movements with this cat manikin. With joints throughout the feet, legs, body, and head, this cat can be maneuvered into any position needed to creat the most precise and accurate drawing. At only 6", it's perfectly sized to fit into any workspace. Made from high quality materials for durability. For artists who specialize in animal work, pair it with our dog, iguana, or other animal manikin to complete your supply. Cats are beautiful animals and it's sometimes hard to portray their grace on the canvas. This cat manikin will help you capture their feline essence. Perfectly proportioned for sketching or drawing, this manikin is invaluable for artists who love to include animals in their work.